By now we should be getting used to Google’s constant updates and changes. Recently, a lot of those changes have had to do with search, and they’ve left a lot of SEOs panicking. Now, it’s turned its attention to ads, specifically the growing market for display ads on mobile devices. It’s called Adwords Enhanced Campaigns and it’s supposed to simplify advertising across multiple platforms. Currently, users can decide whether or not they want to use Enhanced Campaigns, but come mid-2013 and the choice will be taken away, as Enhanced Campaigns becomes the default. The idea, according to Google.com, is to provide advertisers with more contextual information. The more you know about the context in which people view your ads (location, time and device), the more you can tailor your campaigns to make them more relevant to each user. It comes with advanced reporting, which will come in very handy in a time when Big Data is the new big thing. What does Enhanced Campaigns mean for you? According to Laurie Sullivan (mediapost.com), it means small- to medium-sized businesses won’t have to spend ages puzzling over targeting and bidding, which can be confusing non-specialists, but which becomes even more confusing when it comes to multiple devices. It will also simplify ad management, which is a relief to everyone who uses Adwords, even the most skilled campaign managers. As we’ve mentioned, advanced reporting will provide more granular and insightful data, which is invaluable in determining ad performance and ROI. 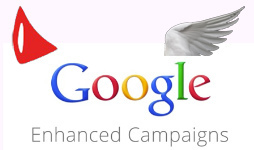 What does Enhanced Campaigns mean for Google? More revenue: Hayley Tsukayama (Washington Post) cites Daina Middleton, CEO of Performics, who says that the change will require advertisers to give up a larger share of their advertising budgets. This is because the gap between click through rates (CTR) on mobile devices and desktops will narrow. It also means that advertisers will need to be far more discerning when it comes to researching and planning their campaigns so that they can maximise their ROI. Google will also have the satisfaction of knowing that they’re finally coming up with ideas to make the most of mobile advertising potential, which is something that they’ve been battling with for some time. The bottom line is that even though the system may be simpler, making the most of it will take more work. It’s time to buckle down and start putting as much work into Adwords as you would into SEO.